One of the more catastrophic types of accidents on roads today are those that involve commercial trucks. These types of trucks include dump trucks, tractor-trailers, 18-wheelers and semi-trucks, and are frequently on the road at almost any time of day. Their sheer size makes it difficult for them to stop quickly and adjust to emergency situations on the road, especially at highway speeds. This can lead to accidents and trucking accidents can result in personal injury and even death. According to the Federal Motor Carrier Safety Administration’s most up-to-date data, the number of large trucks involved in fatal crashes in 2016 was 3,864. In 2016, the total number of police-reported crashes that involved large trucks was 475,000. Of the total, 104,000 resulted in injury. So, when it comes to these types of accidents, why do they happen? And who takes on the liability? Aside from it being difficult for a large commercial truck to come to a sudden stop, there are plenty of causes that can lead to a collision with another motorist on the road. Driver fatigue is a big reason that accidents happen. Commercial truck drivers travel long distances over long periods of time. If they do not adhere to the required rest standards, it could result in an accident. Speeding is also another cause of trucking accidents. Drivers often look to meet certain time constraints and speeding is one way to accomplish this. Unfortunately, it comes at the risk of making the road unsafe for other motorists. When it comes to liability in a collision, the truck driver is definitely one party that can be held responsible. It is important to note that they are not the only ones though. The owner of the commercial truck, the person or company that leased the commercial truck from the owner, or the manufacturer of the commercial truck, tires or other parts can also be held responsible for a victim’s injuries in a collision. While many parties will try to play the blame game, especially when it comes to which insurance coverage will pay the damages, under federal law, any company owning a trucking permit is responsible for all accidents involving a commercial truck with its name displayed on the vehicle — even if it is just a placard slapped on the door. Still, trucking companies will do all they can to escape liability and responsibility in the event of a truck accident. That is why if you have been involved in an accident with a commercial truck, you need help from the Law Offices of Richard A. Stoloff. The New Jersey law firm understands just how complicated a truck accident claim can be and will make sure you have everything you need in order to be properly compensated for any damages suffered. Their years of legal experience will go a long way in getting your life back on track. You should not waste another second looking anywhere else. 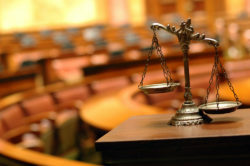 Contact the Law Offices of Richard A. Stoloff today by filling out the online contact form.